Since then, Journey to the West has appeared in close to a hundred movie and TV versions in China and Japan, in both animated and live-action form. One of the most popular was the 1964 Chinese animated feature Havoc/Uproar in Heaven. A 1986 Chinese TV serialization, subtitled in English, was broadcast in America. BBC Sports commissioned Jamie Hewlett of Tank Girl fame to produce a brief promo based upon it for the British participation in the 2008 Summer Olympics in Beijing. Son Goku of Dragon Ball fame is loosely based on the young Monkey King. Now the Monkey King has exploded in the cinemas of China. There have been three theatrical feature films, two live-action and one animated, made since 2014 and released in America theatrically or on pay TV; and a fourth is announced. The first, The Monkey King, was released on January 31, 2014, and is based on the first or “havoc in heaven” sequence of the novel. 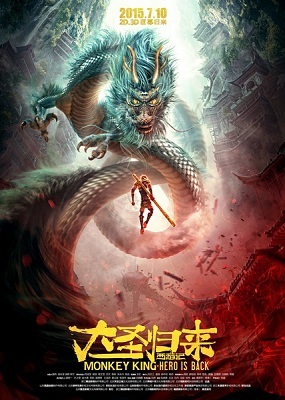 The second, The Monkey King 2: Monkey is Back, and the one animated film, Monkey King: Hero is Back, are both based on the second or “journey” sequence. The live-action film was released in China, Hong Kong, and the U.S. on different days in February 2016. The animated version was released in China on July 10, 2015 and was the highest-grossing animated film in China until the releases of Zootopia and Kung Fu Panda 3. This has been dubbed into English, and sounds like it was dubbed for a young audience. Jackie Chan provides the English-language voice of the Monkey King. A third live-action film, The Monkey King 3, is scheduled for February 2018 release. Monkey King is a folk tale full of gods, monsters, and magic that is solidly based on real world events. In the early 7th century, a leading Chinese Buddhist monk, Xuanzang (ca. 602-664), grew dissatisfied with major discrepancies in the Buddhist scriptures circulating around China. He blamed the many transcriptions of Buddhist texts over the centuries, which were probably based on mistranslations of the original Indian teachings of the Buddha around the early B.C. 500s. He decided that the only way to guarantee the authentic teachings was to travel to India to get a set of them from their country of origin to translate them again. Xuanzang spent several years learning Indian and waited for the international trouble to calm down, for at this time China was at war with the Eastern Göktürks, and Tang Emperor Taizong had declared it illegal to leave China. Finally in 629, Xuanzong left the monastery at Chang’an, persuaded sympathetic Buddhist border guards to let him out of China, and set out on a 17 year journey to India and back. He had many adventures with bandits and warlords, but he was often welcomed and helped by Buddhist priests and local rulers along the way. He became increasingly famous during his journey, and his return to China in 645 was a triumphal parade. He had brought back 657 Sanskrit texts, seven statues of Buddha, and many other spritually significant souvenirs. This led him to recieve a command audience with Emperor Taizong, who urged him to write his memoirs from the detailed notes that he kept. Xuanzong’s “Great Tang Records on the Western Regions” is considered today the only accurate record of the politics and social life of 7th-century western China, the Central Asian kingdoms including modern Afghanistan, northern India, and the Silk Road trade route. Emperor Taizong helped him establish a translation center at Chang’an, and he spent the rest of his life translating the Sanskrit texts that he brought back with him, personally and with many disciple translators. Xuanzang’s epic journey became legendary throughout China in oral form. Of course like many Chinese oral traditions, the story gained many mythological elements over the centuries. Most notably Xuanzang’s supernatural bodyguards: a monkey-spirit, a pig-spirit, and a sand-demon spirit (Xuanzong spent several months crossing the Gobi desert). The monk was also accompanied by a dragon who would transform itself into a pure white horse to serve as Xuanzang's mount. As the story evolved, the animal spirits grew more important until by the time the folk-tale was fixed in writing in the mid-16th century. Saiyūki/Son Goku the Monkey King had become the real hero, with Xuanzang reduced to a comedy-relief supporting character. If you aren't familiar with the Monkey King yet, you have no excuse not to become familiar with him now. I’m sure there was supposed to be a link to “Alakazam the Great”. The entire movie is on YouTube today – all 129½ minutes of the uncut and unedited Japanese version. That is some very impressive background information you've researched! There are parts of that history even I don't know, and I'm Chinese. That's pretty hammy, all right. Looks like fun, though. I am from China，it is Young and old and appropriate Very touching of movie.